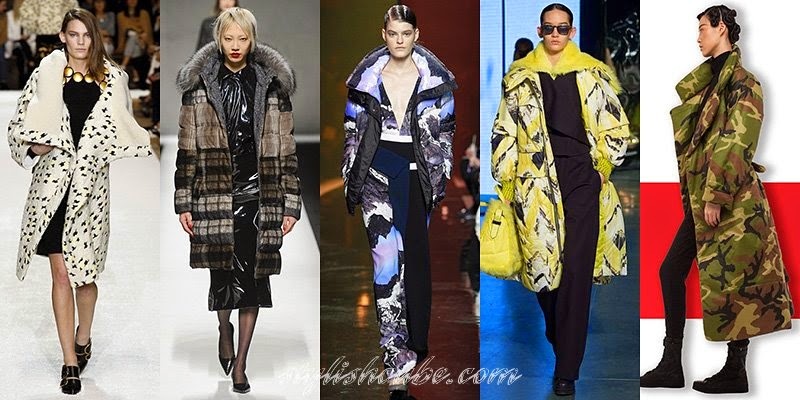 [Fall Winter 2014 -2015 Fashion Trends] - In the new season designers are experimenting with volume of models of outerwear. After fluffy fur, a suitable tool for this was down that helped to implement a number of daring fantasies. 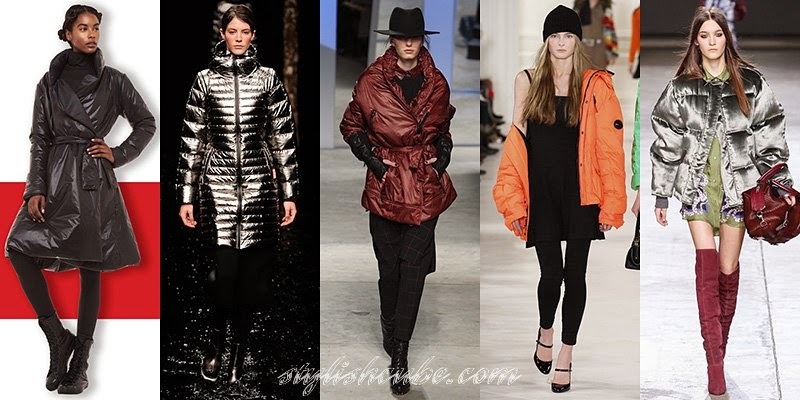 Collection of women's down-padded coats 2015 are interesting and varied, many designers offer at least one model – their own vision of fashion air volume. Taking into account another trend – quilted materials, feminine down-padded coat is claiming its place among the must have items of a fashionable wardrobe. 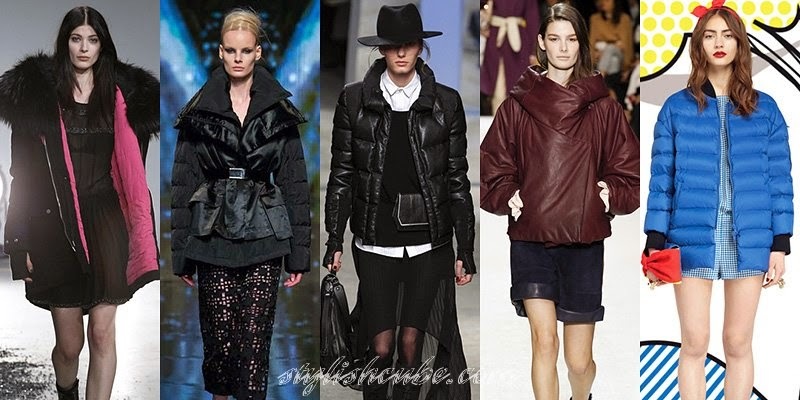 In the styles of women's down-padded coats three main silhouette are emphasized: X-shaped, straight and cocoon. Jackets with semicircular shoulders, voluminous sleeves and neck are in fashion. X-shaped silhouette blends perfectly with the V- neck and hem cut; form-fitting models and down-padded coats of straight silhouette with a belt or strap are available in this category. 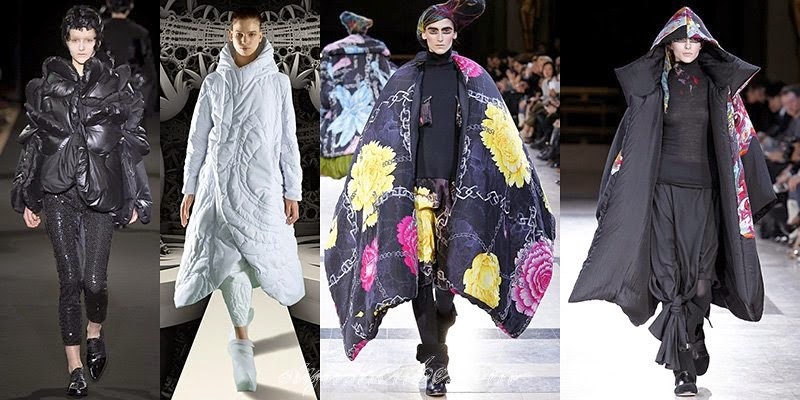 Down-padded coats without quilting, with big, curly or geometric lines are met on the podium: the first two options correspond to the volume of the trend, the rest – quilted materials. 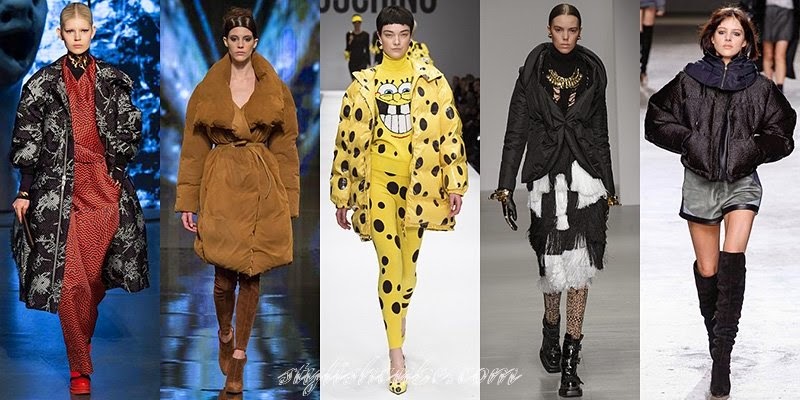 Perhaps, extravagance is included in the list of trends of the season; women's down jackets are models with excessive volume, the original geometric shape, poncho jackets. Large parts of a cut, neck and unusual decor are appropriate for them, for example, puffer frills. Such model is without a doubt able to attract attention. Down-padded coat in the new season are rather shorter than a down jacket. 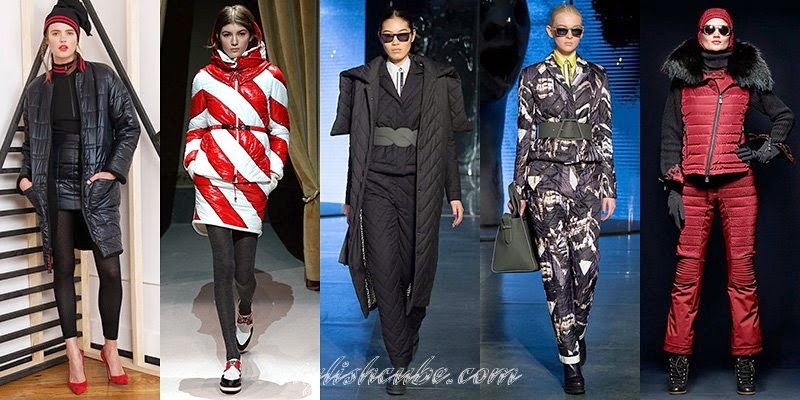 A number of fashion designers tried to create a feeling as if the model envelops the figure; many down-padded coats are plowed or have a hidden zipper. In this case, negligence is appropriate. 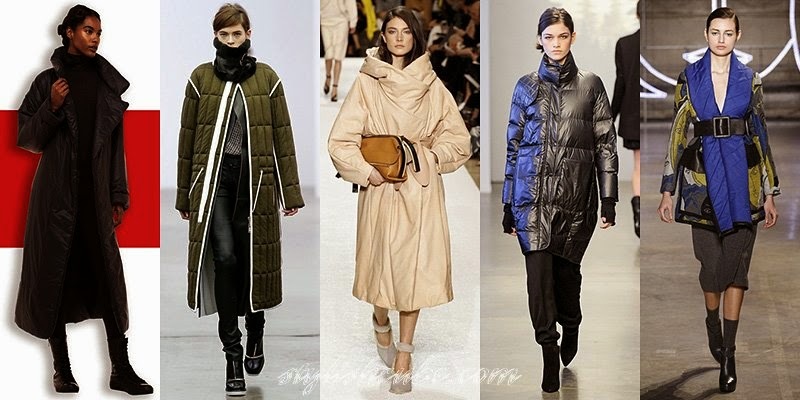 Typically, the length of women's down-padded jackets of the season does not fall below mid-calf. Among the styles of short down-padded coat there are: parkas, straight and close-fitting models, down jackets on the motif of trendy-bomber jackets. Women’s down jackets with layered effect – double zipper or vest look fresh. The second layer is typically a contrast element that is selected for a different color or material. Short and long down jackets are in fashion, but in this season they do not have anything to do with sports style. Designers include them in the modern classic, grunge and extravagant images that look unusual and fresh. For example, fine striped trousers and a long quilted vest of the same material. Bright retro detail – short sleeves and the length of women's down-padded coats – is a trend element of the new season. Even though it is not practical, it looks feminine or with a note of the call, in case of a reference to the style of the 80s. To create this image it is also acceptable to roll up or collect the sleeves. Talking about women's down-padded coats, you cannot miss the fashion trend of quilted suits. Many designers offer skirts and pants that match down-padded coats, so we get a suit in the style of sport-chic, it is important not to fall to the utilitarian of usual ski clothes. The images have a note of extravagance – short quilted skirt, bright print, elegance – classic cut or luxury, for example, fluffy fur collar. 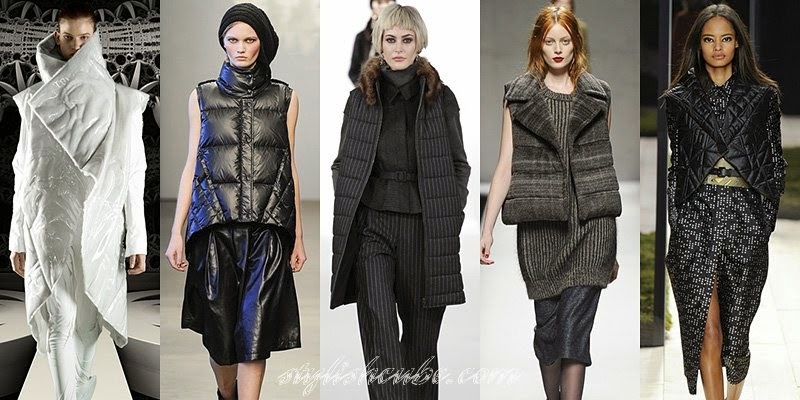 For women's down-padded coats 2015 designers use a full range of fashionable materials of the season: leather, patent leather, and fabrics with sheen, wool and tweed. Fur collar or fringe at the hood – are usual, but at the same time the ultra-fashionable items of women's down-padded jackets. Fluffy fur is typically used to create a vivid contrast of textures. 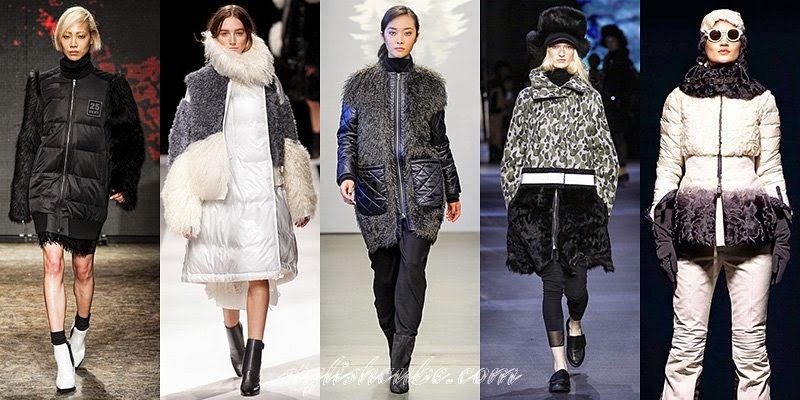 Fresh and interesting trend of the collection of women's down-padded coats is the large down fur details of the cut. In combined models we meet all the varieties of fluffy material from an astrakhan to a llama. Women’s down-padded coats of black color hold primacy, the second in popularity – are coats of wine shades. Also, the seasonal range of colors includes: white, orange, shades of blue and green, blue, beige and yellow. Down-padded coats of different colors with a metallic sheen do not lose their positions. Women's down-padded jackets with fashionable prints are – models with monochrome patterns, the classic check, with landscape and abstract prints. Taking into account the everlasting theme of military, protective print also has the right to exist in the fashionable downy wardrobe.